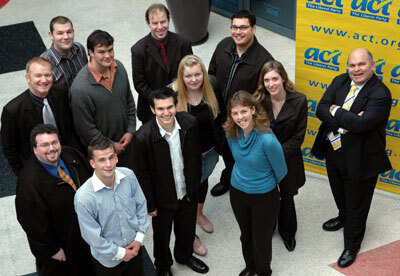 A huge highlight for me this year was working with ACT's, ACT on Campus candidates. I first met David Seymour, Mike Collins and Liz Barkla at the "World Freedom Summit" in Rotorua in July '04. I met Andrew Falloon, Tetauru Emile, Scott Clune and PJ White a little later as they became more active in ACT, earlier this year. I met Helen Simpson and Kerry O'Connor during the candidate selection process. Every single one of these people is a potential MP or party president. What impressed me most was the level of understanding they all have of liberal principles, economics, politics and social trends. I really do mean this. These people are not in politics for social climbing, or to add something to their CVs. They all understand what we are fighting for and are all committed to a better NZ. Every one is an idealist, but they're all grounded and well rounded people. I think this crop of "young turks" will play a big role in ACT and the wider freedom movement in the future. It cheered me no end to have you all on board and I know that Rodney, Heather, Catherine, Brian and the board feel the same way. What also cheers me are the others coming through the ranks behind them. So have a good break guys. Those who've graduated, all the best with your careers. Those who are back on campus next year, keep working on the next crop. But hey- the ACT kids aren't that liberal. They're not enough I'd-rather-cut-my-own-throat-than-pay-tax for me. Hope they have a more active 2006.